Mennonite Board of Missions Photographs, 1898-1967. IV-10-007.2 Box 4 Folder 9. Balodgahan, a Mennonite (Mennonite Church) mission station in the village of that name in the Central Provinces of India. The village of 834 acres was situated seven miles (12 km) southwest of Dhamtari on the Dhamtari-Kanker highway, at the edge of the government-reserved forest. It had previously been considered an outlaw village and because of repeated depredations committed by a criminal band many residents were arrested for crime. The American Mennonite Mission maintained girls' and boys' orphanages from the time of famine in 1899 and 1900. These boys and girls were growing up and arriving at a marriageable age. 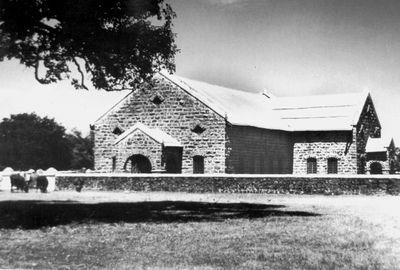 To provide homes for those orphans who wished to settle on land, the mission purchased Balodgahan in 1906 at a cost of 8,000 rupees or an equivalent of $2,650.00. The village area consisted of about 600 acres of proprietary forest and agricultural land and more than 200 fields already in possession of resident non-Christian farmers. There were fewer than 350 inhabitants with very few teams and implements, poorly kept homes, and no village improvements. The mission appointed M. C. Lapp as resident manager to develop the interests of the village, and also authorized the settlement of as many young Christian married couples as could be absorbed into the life of the village. It was soon discovered that the better policy was to sell landholdings to the most industrious and enterprising of the Christian young people in order to build up a self-sustaining Christian community which in the future would also develop into a self-supporting church. By 1913 about fifty Christian homes had been established on farms of five to ten acres. The mission had constructed a bungalow for the missionary manager and his wife. The girls' orphanage had been moved from Rudri (which had been sold to the government) and cottages built for the girls and also a bungalow for the missionaries in charge of the girls' home. During the years following, well-constructed primary and middle-school buildings were built. The village congregation which had become organized contributed substantially toward the cost of a house of worship erected in the center of the village. By 1920 the Christian community had outgrown the first church and the construction of a new and larger one was begun. It was of stone and was finished by 1924. It could accommodate nearly a thousand worshipers. Balodgahan more than justified the financial investment. In 1949 there were living in the village about 700 Christians including children, and 400 non-Christian residents, totaling 1,100. A widows' home was established with about 50 residents. The girls' orphanage became a girls' boarding school. In the 1950s during the school year more than 100 girls were in residence in the institution. Were double the area available for landholdings, it would have soon been taken up by the Indian brethren and sisters who appreciated the value of such investments. Balodgahan greatly contributed to the self-sufficiency and permanence of the Christian community. The church at this location was known as the Bethel Mennonite Church; it celebrated its 100th anniversary in 2006. Brunk, Aldine. "A Missionary Administers an Indian Village." Mennonite Quarterly Review 4 (1930): 60-67. Lapp, George J. "Balodgahan Mission Station (Chhattisgarh State, India)." Global Anabaptist Mennonite Encyclopedia Online. 1953. Web. 23 Apr 2019. http://gameo.org/index.php?title=Balodgahan_Mission_Station_(Chhattisgarh_State,_India)&oldid=143488. Lapp, George J. (1953). Balodgahan Mission Station (Chhattisgarh State, India). Global Anabaptist Mennonite Encyclopedia Online. Retrieved 23 April 2019, from http://gameo.org/index.php?title=Balodgahan_Mission_Station_(Chhattisgarh_State,_India)&oldid=143488.